Our tour leaders’ charms are irresistible! Today, we’re speaking Haing, a tour leader in South East Asia with G Adventures. Find out everything there is to know about him and his tours, from his favourite part of being a tour leader to his favourite local spots to what, exactly, touring in South East Asia entails! Whether you’re here to explore some of South East Asia for yourself, or you just can’t get enough of our tour leaders, you’re in for a treat! Originally from Cambodia, Haing loves making genuine connections with the travellers lucky enough to tour with him. Touring with Haing and G Adventures means enjoying a sense of exploration, learning about new people, places, and events, and, of course, a lot of fun! One of Haing’s favourite parts of working for G Adventures is the way the company makes an effort to give back to local communities on tour. For G Adventures, it instills a sense of pride and respect for the countries they operate out of. For travellers, it means the most authentic, local experiences possible: everyone wins! If South East Asia is on your bucket list, you may be surprised at the changes in culture when you arrive. Not to worry: not only does Haing say that’s normal, he also enjoys watching travellers adjust to the new culture and come away from the experience with a new outlook on their own lives. 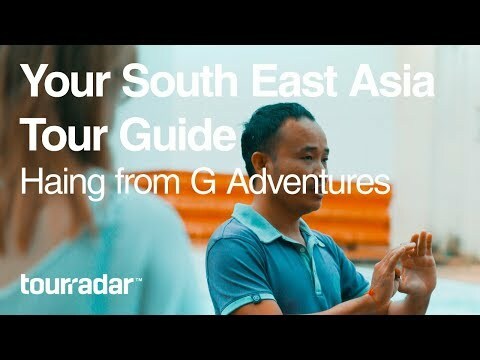 If you’re dying to experience the food, history, culture, and natural beauty of South East Asia for yourself, why not start exploring everything G Adventures and TourRadar have to offer? Who knows – you may find yourself experiencing South East Asia with Haing himself one day soon!